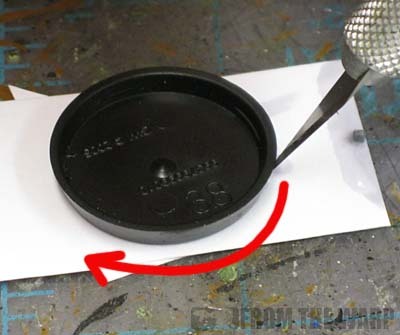 Instead of buying the new Forge World Zone Mortalis brass etch basing kit, here's how you can make your own for next to nothing. The process is super simple, takes very little time and can be expanded to include additional details if you want. Now don't get me wrong, the Forge World bases look cool and they match the Zone Mortalis boards, but you don't need to buy them when you can make them yourself. Believe me, it's super easy to do. Take your base and glue a piece of cardstock over the whole top of it. You want to cover the whole thing and have excess cardstock hanging off all sides. This gives you the foundation to build on with the rest of your layers. The next step is to keep adding additional pieces that cover a portion of the base or select areas until you have a design you like. Make sure your pieces cover your base and you're not gluing them in off to the side. You can hold your layered base up to the light and look through to see your base glued to the underside of your cardstock. Using plasticard might make this hard to do. Once you have a design you like, flip your base over and carefully cut out around the edge. Flip it back over and you're done. Paint it up, mount your model and you're ready to begin playing. The base I did here took me about 5 minutes to finish. Keep in mind, this is a super simple one with just a few pieces of cardstock. 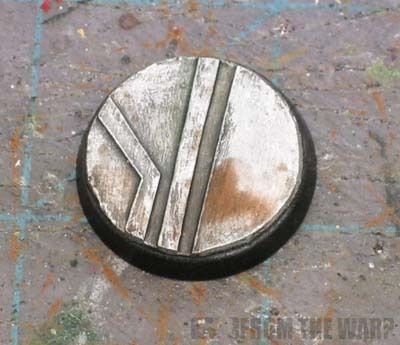 You can make your designs mimic the Forge World patterns just as easy. Or you can create your own designs and give individual squads different themes. And this is just the beginning. You can add lots of other elements onto your base as well. With this model, I used some textured knitting screen to get the open decking look. I added some plasticard with some rivets over that. You can use wire or thin rolls of greenstuff to simulate cables and tubes running across the deck as well. You really can create whatever you want. Painting these guys is super simple too. A quick prime of black followed by a metallic basecoat. Then all you need are a few washes to darken it down and give it that grimy look. I usually use a black wash over the whole thing and then go back and drybrush with my metal color to pick up the edges of my deck plates. After that, I'll use some other colored washes to simulate things like fluid leaks and spills. My favorite way to paint Space Hulk style decks is like this. It requires two specific washes from Secret Weapon minis, but the effect is a very cool one in the end with the deck having a very battle worn, military ship feel to it. I hope this post helps show that you can often recreate what the big companies are doing on your own at a fraction of the cost. And if you don't want to buy the Forge World ones or make your own, there is always the resin base route of which there are tons of companies out there making some very cool deck themed bases. DIY ftw! I love much of the stuff released by GW and FW, but I think this tendency of releasing readymade stuff for virtually everything takes a lot of fun out of the hobby! Doing your own bases and/or terrain can be so much fun, and it allows you to add something really unique to your army! Got a bit of a grudge, Ron? I think it's just a valid solution as buying resin ones, if not better as you're not wasting your standard plastic ones. I like your DIY approach but I think it's a bit poor form to be posting their images and telling people how to do it cheaper. poor form helping people save money? Hey Ron, apparently you can't post DIY stuff here anymore, just post links to GW and FW's order forms. @Longscope: Did you even read Red's comment before you drew the completely wrong conclusion from it? Bacms: I picked it from a local craft store. It's for needlepoint or knitting. They use is as a grid to knit on top of I guess. I saw it and it looked perfect to me although it's a bit too big for my liking in the end. Etchy: I have not thought about walls and floors, but I suspect it could be done with foamboard and some creative use of cardstock. Might not look as detailed, but it's doable for sure. KrautScientist: Making your own stuff has lots of benefits. Sometimes it's best to buy the premade stuff and sometimes it's better to make it yourself. Redscorps: I see what you're saying, but I'm standing by the post. I appreciate the comment. I think FW makes some great stuff... but lots of things can be done on your own as a hobbyist. I believe this is one of those times. And this relates to everything, not just FW stuff. If you really like the look/feel of the FW bits, then by all means pick them up. If cost is an issue, I believe this to be a perfectly viable option. I can be jaded sometimes in thinking everyone has all the FW books and can buy whatever they want from FW no matter what the cost, but not all hobbyists are this lucky. Some look at FW and can only wish they had something even remotely close. This is as close as some hobbyists are ever going to get. I used the Pegasus Gothic Building terrain set and some foamed PVC as a proof-of-concept, but I suspect it would turn out better if you made your own wall sections about an inch thick each and copied them. 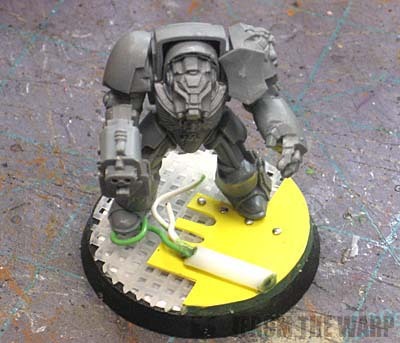 Funny, when I saw these on FW's website I thought the same thing: why would I buy this when I can accomplish the same thing with styrene? I really enjoyed this tutorial. Having bought many forgeworld products and various resin bases, making things myself is a part of the hobby I've always been a bit wary of. But it's tutorials like this that give me the confidence to try it. Also good tip on the mesh! Good tutorial Ron. i always appreciate people who have the skill and patience to make industrial or space hulk bases that look good. I can make this sort of base and have done in the past, but basing is my least favourite part of modelling. i enjoy doing it for characters where i can cut loose a little, but rank and file i go for the basics or buy in pre casts or basing kits. I am considering the forgeworld brass bases, they look really good and have sharp clean lines. i have the original terminator box set from 1989ish with the models untouched so i think ill use the brass bases on them and finally get them Space Hulked up. Myles: No problem, your terrain piece looks good. Anon: Lots of folks probably thought the same thing, this just might help some folks who couldn't make the leap from concept to reality. Tim Walker: This doesn't work every time. Sometimes FW makes some great stuff you just can't make on your own. Gav Conway: Sounds like a plan. 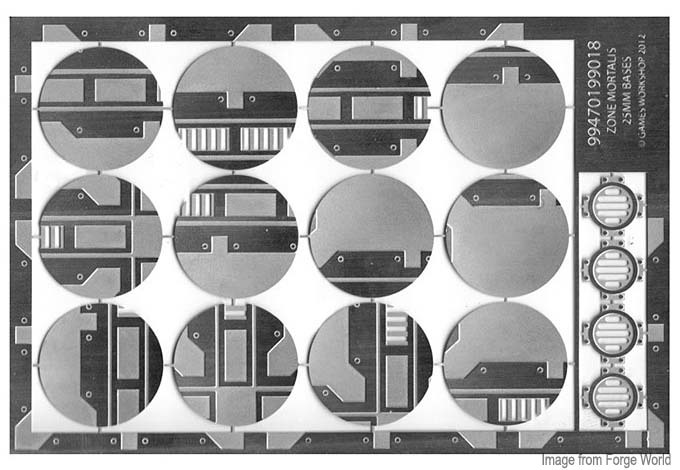 I can see how you would want the super fine detail to go with the models in your case. Spare rhino doors also work very well. I used them to base my Space Hulk models. I definitely want to use some of these for my 25mm bases. This one was awesome, it gets a bookmark for later. @Myles: As for the ZM tiles, I was going to follow suit, but some words of wisdom from the girlfriend pointed out that it was easier and more usable to just build the walls, and setup the table how you like. Wow, third time's the charm? I saw someone doing something close to this on another blog. The big difference is he said he was using vinyl screening, the smaller shapes looked great. Doing some digging around it appears the Home Depot carries vinyl covered polyester screening (if you look up pet screen on their website it should come right up) as an in store only item. The cost is less than $14 for a 3'x7' roll. It's not quite square in the openings, it's not turning me off to it really. I wanted to also say thank you for showing the "gold standard" as well as the hobbyist way of doing it. It really helps on the student gamer budget. That's what keeps me coming back to the blog, even though I'm no longer a 40K player! Arydadan: I've seen that done for other effects as well. It's worth considering though. Xzandrate: Your board there looks great. The walls are all separate from the board itself there? That's cool... you can reposition them however you like in that case. Varangian: Thanks for the kind words and the continued support! Not everything in this hobby can be done on a budget, but I think this is one of those times. Ron, I was just looking for something like this. As much as I dig those Zone Mortalis bases, I'd like to do a full army with those. At a little over $1 a base, that would add up fast. As always, thanks for providing the quick and easy (and cheap!) solution! My only problem is that in times past, the edges of the card I've cut are a little too square and less rounded. Is there a way to avoid that, or should I just get over my perfectionist ways? JustPlainJim: Just take your time cutting them out. Try and make sure to trace super close along the edge and keep your cut consistent. Of course, you could always use a little greenstuff on those areas that still bother you once you have your bases done. A minor imperfection here or there would be no big deal in an army based up like this. I bet you'd have trouble finding it with the whole unit on the table. It's only when you have one base in front of you that all the issues jump out. 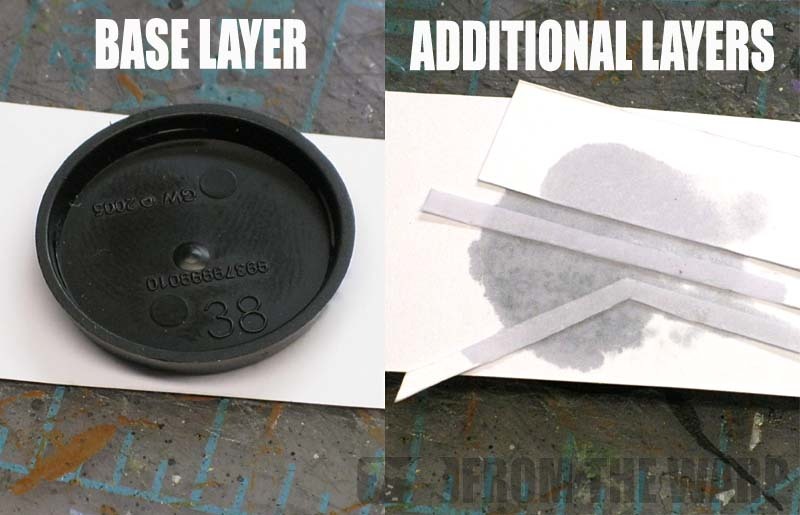 This is a great tutorial, I was struggling with how to do a similar thing for Necron Tomb type bases, so this'll help enormously. Sam: Thanks. The idea with this post was to provide an alternative to the FW bases. There are lots of other alternatives out there and buying the real thing is just as viable. I leave it to you guys to go with the option that works best for you and your budget. I use that plastic mesh (the stuff I got is for gardening...potting I think, two 20cm x 30cm sheets for 100yen!) for my bases too. One question (I hope it wasn't covered and I missed it! )- what are you using for the 'grating' ? Does this come from the miniature train modelers or from somewhere else? Making these types of bases is good fun and adds instant character to the army. Its an excellent way to boost painting scores in tournaments as well! Kierdale: Thanks. Any kind of mesh will work really, glad to hear you found something workable for you. DrGabe: The grating on the one base is some kind of knitting screen. I got it from my local craft store. I suppose you could find similar stuff on hobby sites. I know some companies make wire mesh that you can buy as well. 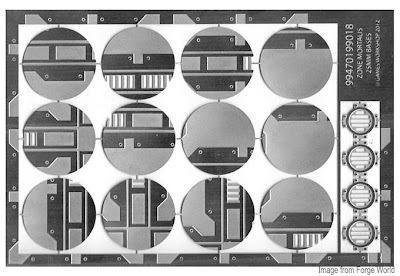 The idea with this post was to show how you could mimic the FW bases with just cardstock or thin plasticard. And you're right, it does add instant character to a force. I think your doing a great job here! The tut is really nice and simple. I'd have an idea for people that want to put a whole army on bases like that. 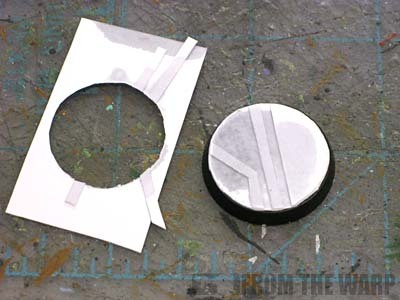 Use a circle cutter. I use it a lot for cutting out circle stencils for Airbrushing. This tool is pretty cheap and saves you lots of time by skipping the trimming step you do. 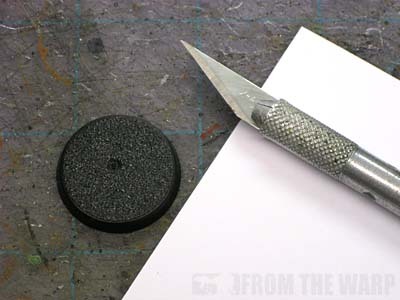 Of course not everyone has one, and your tut uses tools that us hobbyists should have. 2 thumbs up from me! Great tutorial, Ron. Nice to see that there are other options besides "store bought" bases. Anon: Thanks, I never thought about a circle cutter. That would give you nice, clean edges I bet. Runepriest: Thanks. I saw that one kind at my local craft store and picked it up right away. I might have to go back and look to see if they have any other sizes now. Hey Ron, one thing to keep those nay-sayers off your back is that your techniques aren't limited to the 25m bases like the Forge World ones. 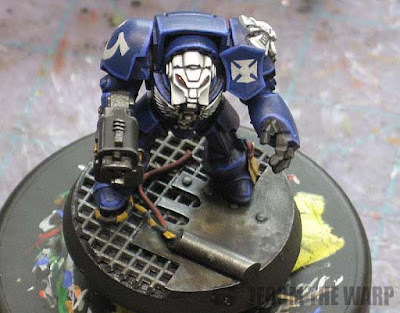 I'm planning on giving my next Space Marine army a tech/industrial feel and I'm using these techniques for everything from infantry to my Stormtalon and evreything in between. That said, do you ever accept pictures of other people's examples? How other people use your ideas and techniques (hopefully successfully)? JustPlainJim: Very true. This kind of thing would fill in those empty bases so an army would look consistent. Good point. And to answer your question, Yes! I love seeing others work and try to get them posted on the site when possible.